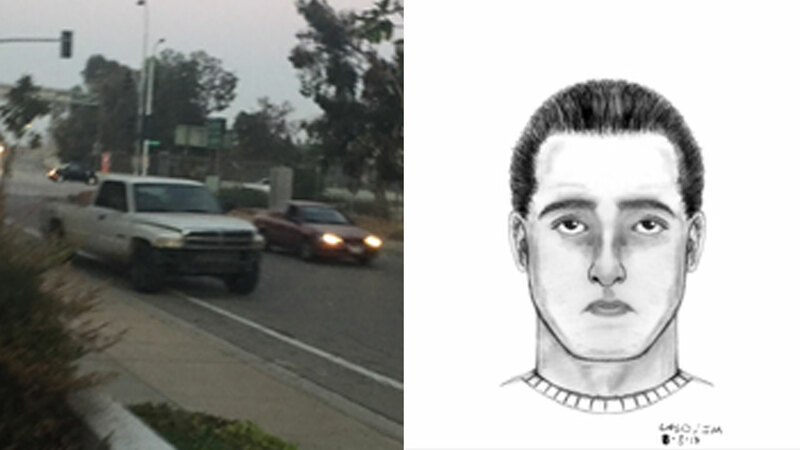 PASADENA, Calif. (KABC) -- Authorities released a sketch of a man suspected of trying to kidnap a woman in Pasadena over the weekend. On July 29, police said an early 2000s model white Dodge Ram pickup truck pulled over along Maple Street as a woman was walking home around 8 p.m. She said she noticed a man standing on the sidewalk near an opened passenger door of his car. The woman said the man tried to drag her a short distance into his vehicle, but she tried to fight him. As she was struggling with the suspect, a witness was driving by, saw the struggle and decided to help. The suspect saw the good Samaritan, let go of the woman and got back into the vehicle, heading westbound on Maple Street and then onto the 134 Freeway. The suspect is described as a man in his 20s, with a light complexion, thin build, clean shaven and has light brown hair. His car possibly has an extended cab with a missing front bumper. Anyone with more information was urged to call Pasadena police Detective Anthony Russo at (626) 744-6412 or the police dispatch line at (626) 744-4241. Those wishing to remain anonymous may call Crime Stoppers at (800) 222-8477.